The La Sportiva Crossover 2.0 GTX is a rock solid winter running shoe, ready for the worst conditions you'll face on the roughest mountain trails, all the way down to messy road running conditions. With a built in Gore Tex gaiter, incredible traction, warmth, amazing stability, quality and security, it may well be the finest winter shoe on the market. The upper consists of 2 separate, but integrated parts. The inner upper consists of a sturdy, breathable and supportive Airmesh, with sewn overlays that do an impressive job holding the midfoot in place. The outer Gore Tex layer contributes to even greater support, but most importantly works as a weather barrier to keep out snow, slush and water and adds a good bit of warmth to the shoe. Gore Tex's claim to be waterproof and breathable is somewhat debatable, but I do find it to work very well as a shoe layer in cold conditions (below freezing) for your average daily run. On warmer days, your feet will likely sweat enough from the inside, that your feet will be damp at the very least, so a non Gore Tex shoe may be preferable (unless you are running in deep slush, in which case the Gore Tex layer helps very much to keep your feet from going numb). 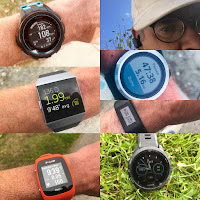 I found the fit of the Crossover 2.0 GTX to run small even when not factoring in a thicker sock, as I would normally wear on cold winter days when I would choose a winter running shoe. I sized up 1/2 size, which, with a mid-weight wool sock is somewhat snug, but not at all constricting. The heel has excellent hold, midfoot fit is very secure/performance oriented and the forefoot is on the narrow and tapered end of the spectrum. My somewhat low volume foot has just a little wiggle room, enough for a little of splay and swell. Forefoot fit is great from a technical performance standpoint, but perhaps not so great if you have a wide foot and prefer more room to stretch out. The built in gaiter is tall enough to rise about an inch above my ankle bone. The zipper is slightly off center as to not be bothersome when flexing forward. I have a skinny ankle, so the pull cord is welcome and the excess cord can be easily tucked inside to avoid bouncing around. I find the gaiter to be sufficient for most trail running scenarios, particularly on packed trails, but when I really spend some time in deep snow, I'll add a taller gaiter for added protection, either a low-ish scree gaiter or if I spend a prolonged amount of time in deeper snow, then will use a much higher gaiter anyways. The tongue is well padded and comfortable. A closer look at the inner upper and support structure. Lacing is very snug and secure. Many (most) of the newer crop of winter trail shoes with integrated gaiters have a quick lace system, which I have really come to prefer, as it is much easier to operate with a zip up gaiter. Quick lace is very fast, easy and convenient, as you do not have to stow the lace, you just zip the gaiter over the excess lace. Not to mention, you can operate quick laces with light gloves which is handy as well. The toe bumper is very thick and protective. Not only will it ward off rock stubs, but provides good structure and protection when using supplemental traction such as Kahtoola Microspikes (my RTR review and traction round up here), running crampons, or even full 12 point strap crampons. Here you can see the integration of the outer gaiter to the inner shoe around the heel. The Crossover 2.0 is easy to slide into and the heel collar is adequately padded, protective and secure. The midsole is injection molded, full length EVA with a TPU stabilizer(red) just in front of the heel on both the medial and lateral sides. I find it to be on the firm side, very supportive, but not particularly responsive. The Crossover 2.0 midsole performs satisfactorily for it's intended purpose, in that it gets the job done in harsh conditions, uneven, rocky, snowy terrain and is not necessarily a shoe I need or expect to be fast and responsive. Protection however is excellent on rough, rocky technical terrain and though the shoe is a bit stiff overall, ground feel and contouring is reasonable. I found that with a 28 mm heel and 17 mm forefoot, the 11mm offset is a bit more than I prefer and felt somewhat pronounced at first, but was never an issue when running. The Crossover 2.0 also has an Ortholite insole which helps with cushion and protection. The outsole is made up of La Sportiva's FriXion AT rubber compound, which is very sticky and wear resistant. The lugs are deep and aggressive, utilizing their tried and true V-Groove design that they have used for years on many other models such as the C-Lite, C-Lite 2.0, Anaconda, the original Crossover and Mutant. Traction is amazing on just about all surfaces (aside from ice), wet conditions, dry rock, snow, slush, steep off trail, mud, talus and scree. You name it, this outsole can handle it. Rock protection is as good as it gets, which helps the Crossover to excel at talus hopping and rocky technical trails. Durability is excellent, as the rate of wear for such a sticky outsole is surprisingly good. It takes quite a few miles for this outsole to even begin to show wear. If more traction is necessary for ice and winter conditions, you can add La Sportiva hobnails (sold separately for $54, full review here). The hobnails are easy to install and provide excellent bite on ice. For it's intended purpose, the Crossover 2.0 is about as good as it gets. Though not particularly light, fast or responsive, the Crossover 2.0 runs reasonably well on mellow surfaces, but truly excels the rougher the terrain and the worse the conditions. Stability, control, ground feel and traction all combine to inspire confidence off trail, on technical terrain and in snowy, wintry conditions. I gravitate toward this shoe when conditions are bad (below freezing, accumulated snow), so I tend to not be running my fastest anyways, but on smoother, drier sections of trail, I found that with a little bit of a push, the Crossover can handle short bursts of speed without issue. If you are looking for a warm, waterproof, durable, high quality, all mountain shoe with a built in gaiter and top notch traction that can handle the worst that winter weather has to offer, this is your shoe. Though the Crossover is a mountain trail shoe by design, I find that it would also make a great shoe for running snowy, wet roads and paths. With impeccable traction and great waterproofing, for snowy, sloppy road conditions, I would prefer this shoe to an all weather road shoe with lesser traction. La Sportiva Crossover 2.0 GTX vs. Salomon XA Alpine (my RTR review here) - The Salomon is comparable in weight, protection and wet traction, but the Crossover has more aggressive lugs and gets better grip in snow, mud and steep, loose dirt. Both are very precise fitting, stable and protective. The Crossover has better waterproofing, is warmer and costs $60 less. Even though close in weight, if more spirited running is the focus, the Salomon feels more like a running shoe, with a little better response and transition. La Sportiva Crossover 2.0 GTX vs. Saucony Razor Ice+ (my RTR review here) - The Razor Ice+ is lighter by nearly 2 oz. per shoe, but feels much lighter than the 2 oz. difference suggests. 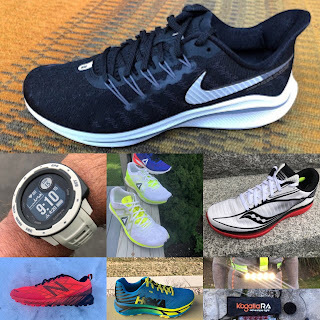 The Razor Ice+ does not have the protection, traction (lugs are very minimal in comparison), warmth or overall rugged durability, but is a much more responsive shoe geared toward fast running. For running fast and racing on moderate trails, or using with running snowshoes, the Razor Ice+ is the clear winner. For steeper terrain, off trail, all mountain, colder, wetter, snowier conditions, I would pick the Crossover. -.1 for lacing, sure would be nice to have a quick lace like most of the other high tip winter running shoes. The Crossover 2.0 GTX was provided at no charge. The opinions herein are entirely the author's.